The trial of Adolf Eichmann, one of the main Nazi architects of the Holocaust, started 50 years ago today. The proceedings, which took place 15 years after the Nuremberg Tribunals, forced the world to relive the Third Reich's atrocities. TIME looks back on other momentous trials. It's not simply known as the Dreyfus trial. It's not the Dreyfus case. It's the Dreyfus Affair, a scandal that embroiled France and reverberated throughout Europe and the United States. In 1894, Alfred Dreyfus, a captain in the French army  and a Jew  was falsely accused of selling military secrets to Germany. He proclaimed his innocence and the evidence was weak, but he was court-martialed, convicted for high treason, and sentenced to life imprisonment on Devil's Island. He remained there for years, despite evidence that another man was guilty. The conspiracy against Dreyfus involved forged documents and the stifling of further investigation. France was divided into Anti-Dreyfusards and Dreyfusards, one of whom was the novelist Èmile Zola. In 1898 he championed Dreyfus' cause in an open letter to the French president, entitled "J'Accuse." Zola himself was put on trial, and convicted, for libel. Anti-Semitism raged. And though Dreyfus was retried in 1899, he was found guilty again. The president pardoned him, but it took a civilian court of appeals to clear Dreyfus in 1906, after which he was reinstated and awarded the Legion of Honor. 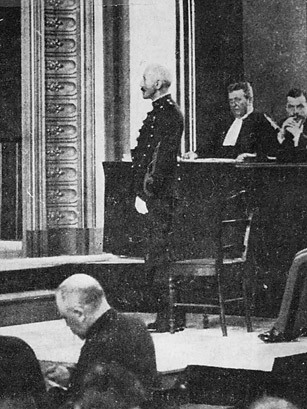 It wasn't until 1995, however  more than a hundred years since he was first accused, and decades after he'd fought for France in World War I  that the French army publicly stated that Dreyfus was innocent.